● Direct assignment of routes on a map simplifying this process. ● Geofencing: Control in real time of the exact location of the truck and its transit on the marked route. If it moves away from parameterized distances in the system an alarm is automatically sent to the headquarters or to possible security companies that have been contracted. ● It calculates the arrival time for each route with the possibility of a warning in case of delays. 1-. 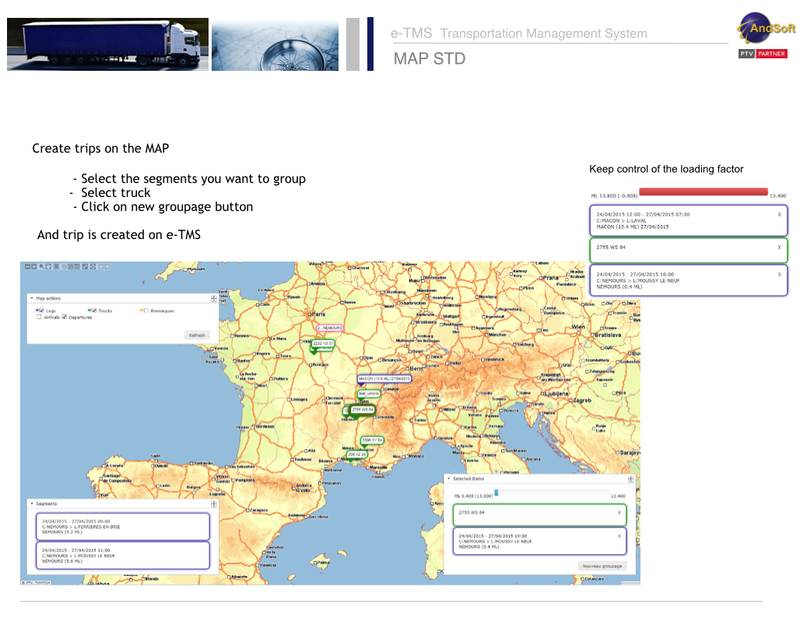 Map Planning: It allows numerous functionalities for each trip. For example, you can assign a trip to the fleet of trucks from the map (Create trips on the map), for both full loads and groupage. Also you can mark for each driver the geographical points where he must cross on his route, reducing the errors of correct address for the final destination. In short, a new display interface of allocation of routes in which everything is done directly on the map. 2-. RoadCost: Statistics module to calculate the most optimal route between two points (the shortest, fastest and cheapest). It also calculates all the costs associated to the route and the impact of the carbon footprint. 3-. Mapping +: It is composed of the following modules. Geocode converts any address into Geopositions so AndSoft can trace a route on the map. Geofencing: Controls in real time that the truck is following exactly the determined route or zone. E.T.A control (Estimated Time of Arrival) to calculate “On Time” trips or possible delays. These types of tools are more and more on demand by road transport companies, because they cover in graphic and easy way the core business of transport and logistics operators.